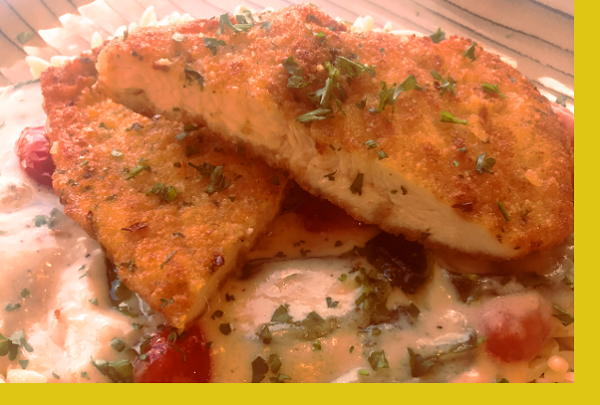 Breaded Italian chicken cutlets pan fried for a crispy, wholesome flavor and served with a creamy spinach & tomato orzo. Chicken: In a wide bowl, beat eggs until frothy. Pour flour in shallow platter and bread crumbs on a plate. Lightly dredge both sides of chicken in flour, dip in egg wash to coat completely, let excess drip off, dredge in bread crumbs. Coat a skillet with oil and heat on medium heat. Saute chicken, in batches if needed, 3 to 4 minutes per side. Add more oil as needed. Orzo: Bring water to a boil. Add orzo. Boil for 12-14 mins or to desired tenderness. Drain well. Sauce: Coat a skillet with oil and heat on medium high. Saute tomatoes for 2 mins. Add spinach and saute for 2 mins. Add sauce and heat until thoroughly warm. Serve. This came out restaurant quality. I love Maria's sauces. I also enjoyed putting it all together. Not only was this delicious, it was easy to prepare with the great directions. A little more complicated than some dishes but it made me feel more like a chef than a short-order cook. This was by far the best dinner we have had to date and we've tried several of Chef Maria's! The sauce is on the richer side (we LOVED it) but it is one thing to note. 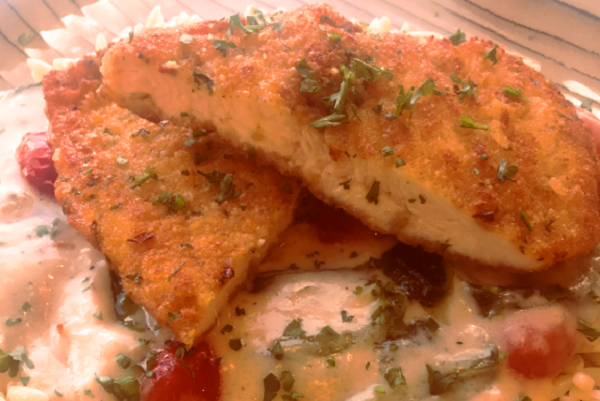 The chicken Milanese was a favorite. It takes a bit to prepare with breading and cooking the chicken but worth it. Would def order again. This meal involves a little bit of work, but it is really delicious and both my husband and I have enjoyed it. It will be on my regular 'order list'. Thank you Maria.